Plans have been submitted for a new mixed-use development on a vacant site in Liverpool’s Baltic Triangle area. 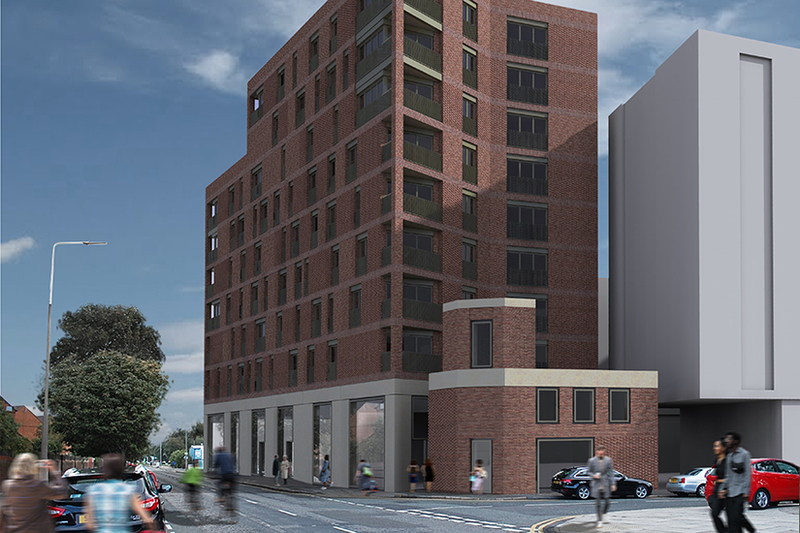 The proposed scheme features 44 apartments and around 5,381 sq ft of commercial space on St James Street, between the junctions of Brick Street and Norfolk Street. The site, which is adjacent to the former Liver Grease Works and faces the church of Saint Vincent de Paul, has lain vacant for the past 20 years. If approved by Liverpool City Council, the scheme designed by MgMaStudio architecture on behalf of LPS Real Estate, will comprise two separate buildings, the larger of which would accommodate the full range of one, two and three bedroomed apartments as well as the majority of the proposed retail and leisure space. Matthew Ashton, a director at MgMaStudio, says: “The proposed development would make a genuinely positive contribution to the local area; constructed to a high specification and bringing back into use a vacant site, which in turn increases the sense of movement and community within the area. Joe Gervin, director at LPS Real Estate, adds: “The development will incorporate a Scandinavian-themed roof top garden and aims to reinforce Liverpool’s Baltic connections through minimalist styled apartments and commercial space.